Saturday 31 October 2015. Vanua Lava, Banks Island Group, Vanuatu. Village of Sola. Early on a balmy, lazy Saturday morning, our Zodiacs puttered up to the beach in front of the 'Sola Yaith Club' and were met by the local commodore, Robert. The only yacht club on Vanua Lava, it has neither a marina nor bar. Instead, a little lean-to is fitted with a few rudimentary tables and chairs, with rough hewn benches in front to savour the glorious view out across the bay. Two visiting yachts are moored in the bay, one flying the French flag has sailed from the Caribbean. One of the key selling points for any Heritage Expeditions journey is their intimate focus on natural subjects including flora and fauna. Birds, in particular. 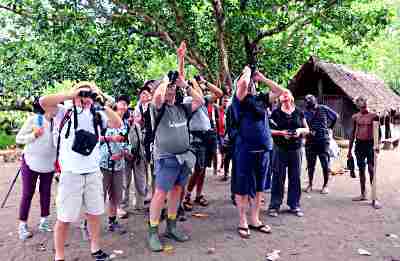 Numerous birding groups from around the world call on the Russ family expertise and their experienced guides like, Adam Walleyn. So here I am on 'Spirit of Enderby' again infiltrating a squad of dedicated and committed 'twitchers' in search of additions to their 'life list' of bird species. One of the species keenly sought by the team on every landing is the White Eye (genus Zosterops) and its unique species like the Malaita White Eye (Zosterops stresemanni) which, ironically does not have the trademark white eye patch. The other getting our spotters all atwitter is the family Myzomela, a group of small colourful honeyeaters usually recognised by their bright red heads and breasts. It's these poor little birds whose plumage is sought after for the Nendo red feather money. The birds, I'm told, are captured in a sticky sap trap and the required feathers removed before the bird is released. Whether the plucked honeyeaters survive this invasive procedure is not clear. Immediately ashore at Sola, the detachment is straight into action with telescopes and Swarovski binoculars trained skyward in the hope of finding Vanuatu's endemic white eye and honeyeater. The Tanna Fruit Dove was a bonus. Serious birding is only for the committed twitcher with many early starts, often pre-dawn, to ensure optimum sighting opportunities. A comic series of events ensued as I sought a local SIM card for a sniff of real Internet. A local chap found a spare card for me which I traded a dynamo radio. He seemed pleased.